Larry Houghton of Lamb Engineering in the UK keeps a low profile on the custom motorcycle scene. But he’s got an unerring eye when it comes to building show winners: his latest BSA motorcycle took the top trophy at Custom Chrome’s recent European Bike Show. 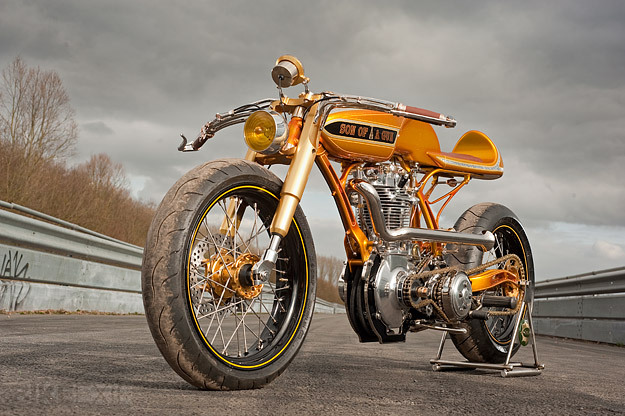 ‘Son Of A Gun’ is based on a BSA Gold Star, although there’s little left of the original. The engine is a 1951 ZB-model single—which makes it 499cc, I’m assuming—and according to Larry, it’s an ex-racing engine. (Which makes sense, because BSA offered different compression ratios and camshafts to cater for the sporting fraternity.) The gearbox is thought to be from a BSA M20 military motorcycle, and that’s where the vintage authenticity ends. The steel frame was handcrafted, forged and welded to give “a light, spindly look.” The swingarm is also steel and the suspension uses a combination of chains and springs. Lamb Engineering machined the forks from alloy and fitted 17” supermoto wheels attached to Talon hubs. 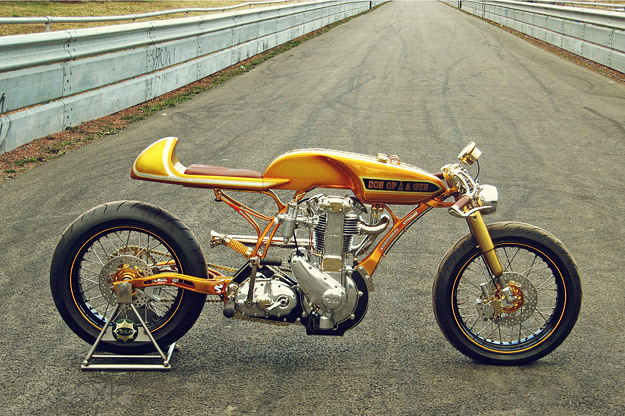 “The design cues are taken from a mixture of 60s racing Hondas and fizzies [Yamaha FS1E],” says Larry. “This BSA motorcycle has taken over 1,200 hours of work, although the cost was fairly minimal compared to a lot of custom machines. The engine, gearbox and wheels were all eBay purchases, and the other materials are scrap from a friend’s steel yard.” Larry estimates that the total cost, including paint, is around £6,000 (US$9,800)—obviously not including labor. 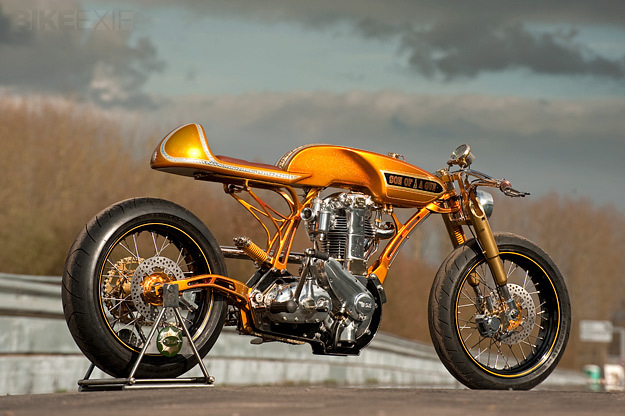 A small price to pay for one of the most prestigious custom motorcycle trophies in Europe.